The Arlandrian: Where Did THAT Garden Come From? Where Did THAT Garden Come From? Why, your friendly neighborhood volunteers installed it, of course. Last Saturday, a team of over a dozen volunteers from Arlandria and surrounding neighborhoods came together and got started on a host of projects. This was the 2nd annual Arlandria Spring Clean-Up and Gardening Day! The number one initiative was to install a large garden at the open space property at the corner of West Reed and Commonwealth Avenues, acquired by the City just last year. The garden came together using plants gleaned from backyard gardens, generously donated by local residents. In total, our generous neighbors contributed 13 shrubs, dozens of perennials, a sapling, and ornamental grasses... and there's at least one ornamental tree and a bunch of liriope yet to plant! So, for this coincidentally Earth Day weekend event, volunteers used donated plants, composted leaves from last Fall's leaf pick-up, and mulch from shredded Christmas trees. And all of it was hauled to the site in borrowed trucks. Sod removed from the site was used by some neighbors in their own backyards. And you wind up with a 700 sqft patch of garden to be proud of. Look for more enhancements to come. 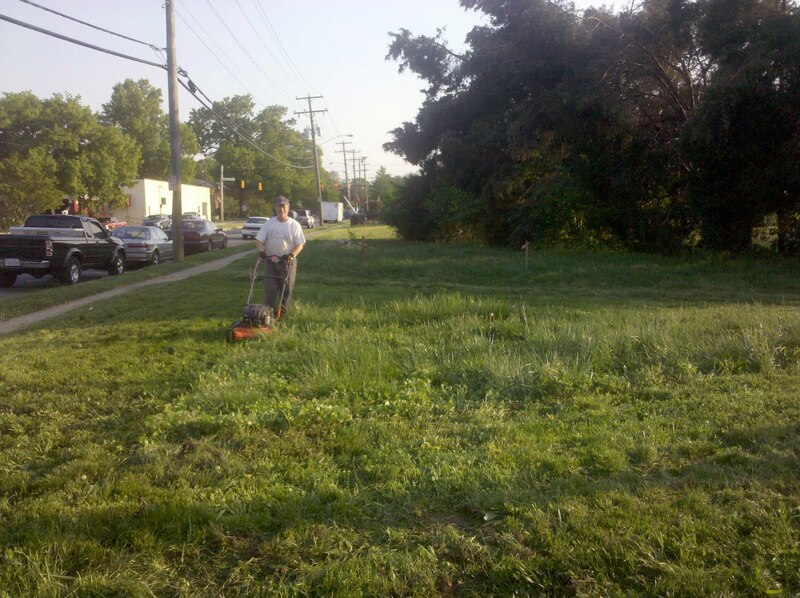 Another task from Saturday was cleaning up the vacant lots on Mount Vernon Avenue that are slated to expand the 55-acre Four Mile Run park. The properties had been ignored by parks staff and were badly in need of a once over. 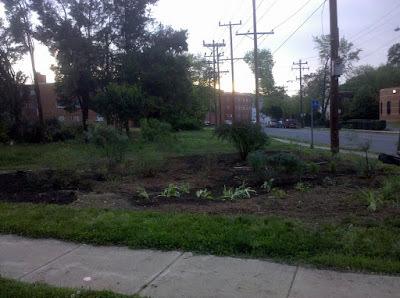 While the majority of the team focused on the Reed Avenue garden, a second group weeded and re-mulched the garden at the entrance of 4MR, trimmed some out of control street trees, and cleaned up junk on the site. Lastly, back at the Reed Avenue site, the haggard screening trees that used to block the power substation were thinned out for aesthetics and to prevent them from blocking a clear view for the police. Trees that were strangling each other now have some room to grow and thrive. Once again, Campbell and Ferrara Garden Center in Annandale donated mulch to the cause. Home Depot also contributed enough to get about 20 bags of top-soil that will hopefully keep the new plants growing strong. Many thanks to the management of both establishments! Many thanks to our generous neighbors, as well! Your donated plants made it all possible. Please continue to let us know if you have plants you're dividing or otherwise getting rid of. We'll continue to enhance our existing gardens and create new green spaces with whatever we get! Lastly, thanks to the volunteers for all the backbreaking work. Future clean-ups to prep the site for a market will follow, so stay tuned. But this was a big step towards improving Arlandria open space. Very nice! I know working with soil around here is the worst. Congratulations Nick, Arlandria is really coming into it's own as a neighborhood/community with participation like this. Know your blog is a big part of it. Thanks William and Virginia! 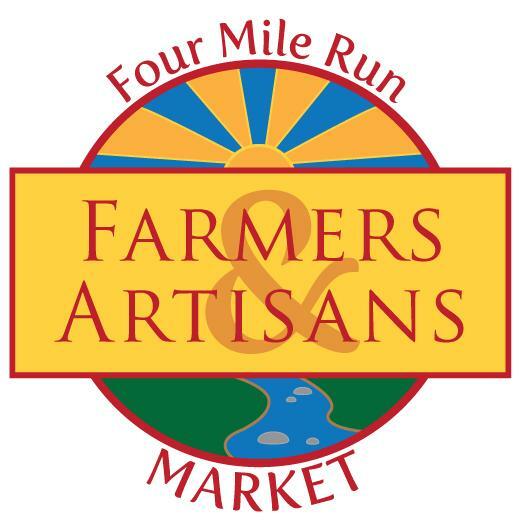 This has been an ongoing effort and the community has really come together to make these kinds of projects happen. I loved your Blog for best Earth Day Quiz for allFor Planting trees, I'm going to Follow Your Post for my Gardening and planting trees on Earth day. You are an amazing nature loving Person.